PARSLEY If you ate out anywhere in the 70s and 80s your memories of parsley are probably that curly leaf garnish that was put on any plate you ordered. The good news is there’s far more to it than that. You can grow the curly variety, name, or the flat leafed parsley. The flat-leaf has a less coarse, full-on flavour than the curly. I use the curly snipped into scrambled eggs or added to hearty soaps and stews. I have to admit, I’m a huge fan of flat leaf parsley, chopping it into salads, sandwiches, soups and all sorts. It makes a lovely pesto blitzed with goat’s cheese and walnuts and chilli, blended with oil. It’s good for treating bloating and stomach ache, and can be chewed to freshen breath, too. How to grow: Sow seed regularly for a steady supply. It’s a pesky one to germinate, and likes heat so if you’ve got a warm windowsill or a propagator then happy days! Grow on till about 10cm high, and harden off by putting outside in a sheltered spot during the day every day for a fortnight, bringing in overnight. The next week, leave the plants outside through the night for three days before planting out. Top tip: Parsley loves being fed. Give it some comfrey tea or seaweed feed and it’ll reward you with bushy growth. Before planting out, prep your parsley patch, digging in lots of organic matter as it loves a rich soil. You’ll need to replace your parsley plants every two years as parsley is a biennial, meaning it sets seed in its second year. CHIVES Lovely oniony goodness and flowers too – chives are a fantastic plant to grow. Whether you sow seeds or buy a plant, they are well worth adding to your list. Their flowers are edible, and a fantastic addition to salads (but don’t eat them whole unless you want your head blowing off!) Chop them to the ground and there will be a flush of tasty new growth – you can do this about four times over the summer. Or, you could leave the chive flowers for the bees, which they love. There is a variety called garlic chives that have white flowers with a subtle garlic hint, and are just as delicious. How to grow: Sow seed in a pot and put somewhere warm and dark (think airing cupboard) to germinate. When they sprout you can move them into the light. Or, if you have a chive plant you can split it into separate clumps by gently teasing apart the roots. Top tip: They are a good companion plant and if you grow them near apple trees they are said to deter apple scab. It will quickly grow into a large clump and it will reseed quite easily but regular harvesting of the leaves will keep the lemon balm in check. The best leaves to pick are the youngest at the top of the stems, and if you removing the flowers regularly it will help the plant bush up. It will die back over winter but don’t worry, it will soon return come spring. Pick off the young leaves and dry on kitchen paper before combining with black tea for DIY balm tea. How to grow: Comes easily from seed, and will root well from softwood cuttings too. It loves rich soil, so remember to add in organic matter, and performs best in shady spots. Top tip: It’s best used fresh as the lemony flavour doesn’t take cooking well (so add at the end) and if you’re planning to dry the leaves for tea, then don’t let it flower. Not as popular in the UK as in France, this has a really sharp lemony zing which gives it its distinctive taste. It’s lovely chopped with rosemary and mixed with butter, salt and pepper over new potatoes – yum! You can grow it as an annual, regularly picking off the baby leaves, or as a perennial (it will become a right pain to dig out after a few years). The leaves wilt like spinach, so if you’re making sorrel soup don’t be alarmed at how much you have to pick, but it’s delicious. It’s quick to bolt, which is why it does better in shade, so if you see it developing flower heads in early summer, lop it down to the ground and it’ll be baby young leaves coming through in no time. Best used fresh, as it does not keep once picked. How to grow: Sow seeds and transplant out when about 10cm tall and hardened off. It likes rich, moist soil and will take about two months two reach edible loveliness. 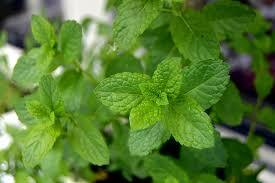 MINT Mint is the classic aromatic herb which has myriad uses, from cocktails to chocolate, sauces and salads. Place a pot by the door for cooking, or place where you sit out so you can crush and smell the aromatic foliage. The very best teas are made with Moroccan mint or black peppermint, I reckon, while ‘Eau de Cologne’ is just incredible for bathing, when the steam releases its oils. It will spread quickly, so it’s best to put in a pot and pick off the runners it sends out. Keep on top of the flowers and snip them off regularly to prolong the growing season. How to grow: Cuttings of mint will root in water and can be potted on; it will grow from pieces of root popped into a pot and kept watered. If you’re planning to harvest a lot, then it will thank you for a good mulch to lock in moisture and nutrients. Top tip: Its flavour is strongest just before flowering.